The world governing body of football, Fifa, was plunged into an unprecedented crisis on the eve of its congress in Zurich after Swiss authorities arrested a string of officials in a dawn raid and opened criminal proceedings over the awarding of the 2018 and 2022 World Cups. More than a dozen plainclothed officers descended on the five-star Baur au Lac hotel on Wednesday, where officials had gathered for Fifa’s annual meeting. The arrests were made on behalf of US authorities, after an FBI investigation that has been ongoing for at least three years. The US Department of Justice said authorities had charged 14 officials, nine of whom are current or former Fifa executives. Those arrested in Zurich face extradition to the US. Separately, Swiss federal prosecutors said they had opened criminal proceedings in connection with the award of the 2018 World Cup to Russia and the 2022 tournament to Qatar. These decisions have been shrouded in claims of bribery and corruption ever since the vote in December 2010. The Swiss authorities seized “electronic data and documents” in a raid on Fifa headquarters. Bank documents had earlier been collected from various Swiss financial institutions. Police will question 10 members of the Fifa executive committee who took part in the World Cup votes. The 10, all still current members of Fifa’s ExCo, include senior vice-president Issa Hayatou of Cameroon and Vitaly Mutko, Russia’s sports minister who is head of the country’s 2018 World Cup organising committee. The others are Angel Maria Villar Llona (Spain), Michel D’Hooghe (Belgium), Senes Erzik (Turkey), Worawi Makudi (Thailand), Marios Lefkaritis (Cyprus), Jacques Anouma (Ivory Coast), Rafael Salguero (Guatemala) and Hany Abo Rida (Egypt). In a statement, the Swiss attorney general’s office said the executives were being questioned on suspicion of “criminal mismanagement” and money laundering. It said the timing of the operation was deliberately co-ordinated with the arrests on behalf of the US authorities “to avoid any possible collusion” between suspects and because a large number of those involved in the voting for the two World Cups were present in Zurich, where Fifa president Sepp Blatter was expected to be re-elected for another four-year term on Friday. At a later press conference at Fifa headquarters, spokesman Walter de Gregorio denied Blatter was in any way involved with either investigation and said that the Swiss proceedings were as a result of information provided by Fifa to the attorney general’s office in November 2014. He also confirmed that there was no suggestion that Russia or Qatar would lose the World Cup. The organisation had not paid taxes for several years when its president was Jack Warner and Chuck Blazer was secretary general. As well as Webb, the Department of Justice statement confirmed the Fifa officials charged were Eugenio Figueredo, Jack Warner, Eduardo Li, Julio Rocha, Costas Takkas, Rafael Esquivel, José Maria Marin and Nicolás Leoz. A further four defendants were the sports marketing executives Alejandro Burzaco, Aaron Davidson, Hugo Jinkis and Mariano Jinkis. A further marketing executive, José Marguiles, was charged as an intermediary. The DoJ statement confirmed the charges were for racketeering, wire fraud and money laundering conspiracies, “among other offences” and alleged a “24-year scheme to enrich themselves through the corruption of international soccer”. The charges were announced by the US attorney general Loretta Lynch. The arrests came two days before Fifa president Blatter had expected to be re-elected for a fifth term. On Wednesday morning, Blatter – who was not among those arrested – was said to be actively lobbying to have Friday’s election postponed. Blatter has been closely entwined with many of those charged in the US during his 40 years at Fifa, including the Paraguayan Leoz and the Trinidadian Warner. Webb and Figuero are current Fifa vice-presidents. Last year it emerged that Blazer, who was forced to resign after being accused of financial irregularities, had been helping the FBI with its long-running inquiry. The DoJ statement said Blazer had already pleaded guilty to charges, as had José Hawilla, the owner and founder of the Traffic Group, a multinational sports marketing agency with its headquarters in Brazil. Blazer wore a wiretap at the London 2012 Olympics and, although seriously ill, has been continuing to help the FBI with its investigation. The raids in Zurich are believed to have begun shortly before 6am, when six Fifa officials were led from the Bauer au Lac hotel to unmarked cars with sheets over their heads. The Swiss Federal Office of Justice (FOJ) said: “The US attorney’s office for the eastern district of New York is investigating these individuals on suspicion of the acceptance of bribes and kickbacks between the early 1990s and the present day. 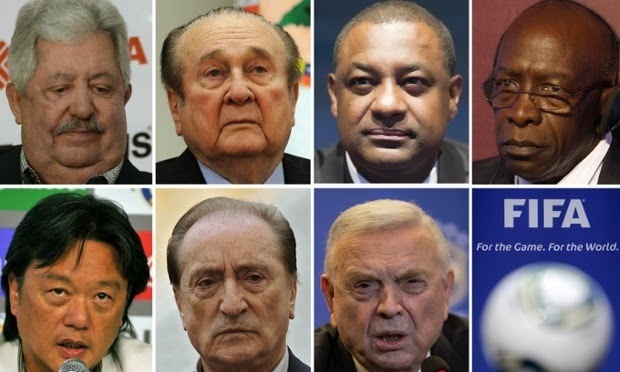 “The bribery suspects – representatives of sports media and sports promotion firms – are alleged to have been involved in schemes to make payments to the soccer functionaries – delegates of Fifa (Fédération Internationale de Football Association) and other functionaries of Fifa sub-organisations – totalling more than $100m. Pressure is now bound to build on Blatter to postpone Friday’s election, where he is standing against Jordanian Prince Ali Bin al-Hussein.